Drain Unclogging and Expert Drain Cleaning Everett Folks Can Depend Upon! Read Some of the Plumbing and Drain Cleaning Reviews we've gotten! Nearly half of all plumbing issues come from a clog or stoppage of some sort, keeping your convenient indoor plumbing from eliminating hazardous waste and wastewater from your home. 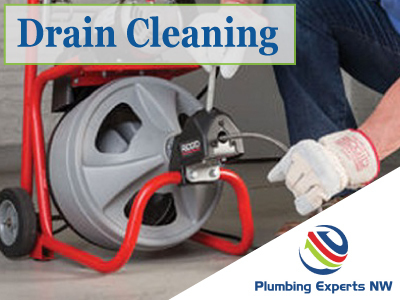 You need a drain cleaning service that comes to you fast and fixes your issue in the most efficient way possible. That's why Plumbing Experts NW wants to be your drain unclogging specialist when these annoying clogs and stoppages occur. With decades of experience, our plumbing technicians don't just handle your leaks, toilets, and faucets, but we approach your drain clogs with expertise, giving you a clear idea of what's stopping up your drains. This is the kind of expert drain cleaning Everett WA families need and can rely on to get a solution quickly and affordably. As with all of our other plumbing services, we come to handle your drain cleaning issue by being an adviser to you, presenting all of your options clearly.